Schlepping Along to the Manger. 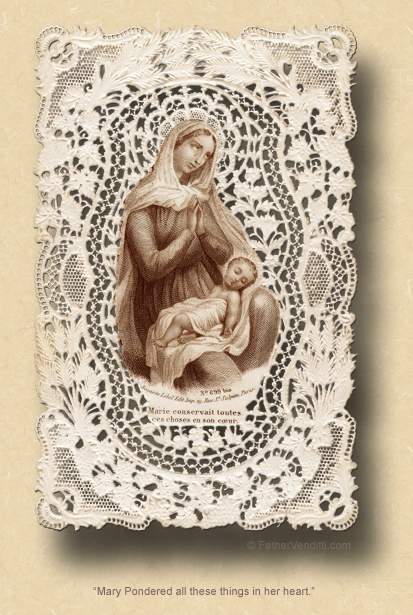 The Octave Day of the Nativity: the Solemnity of Mary, the Holy Mother of God. • Psalm 67: 2-3, 5-6, 8. The First Class Feast of the Octave Day of the Nativity. • Psalm 97: 3, 4, 2. The Solemn Holy Day of the Circumcision of Our Lord, God & Savior, Jesus Christ, and of our Holy Father Basil the Great, Archbishop of Cæsarea in Cappadocia. • Luke 2: 20-21, 40-52. 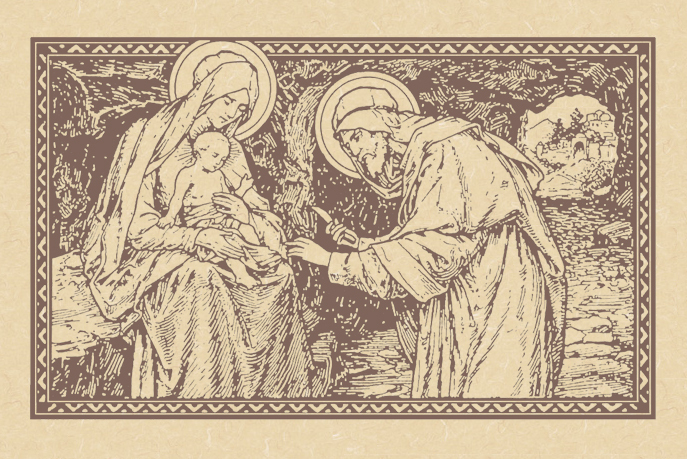 8:33 AM 1/1/2016 — The Octave Day of the Nativity—which is always the first of the year, because that's what an octave means: it's eight days after the fact—has had something of a confusing history over the centuries. For almost a thousand years, this day was observed as the Feast of the Circumcision of our Lord, not to be confused with the Presentation of our Lord, which is a different event altogether. In fact, in the Eastern Churches, today is still the Feast of the Circumcision; and, in Churches of the Constantinopolitan or Byzantine tradition, it's combined with the Feast of St. Basil the Great, so there are two Epistles and two Gospels and two of everything. But it's certainly not a novelty to celebrate a feast of the Maternity of the Blessed Virgin at Christmas time, even though the various Churches of Christendom have done it on different days. In the Byzantine Churches, they celebrate it the very day after Christmas, the same day that we celebrate the feast of St. Stephen; but, the eventual decision of the Latin Church to transfer the Maternity of Mary to the Octave Day of the Nativity on January 1st is not without historicity, nor is it inappropriate, especially when you realize that the Scripture lessons given to us to read this day are the very lessons from the old Feast of the Circumcision; and, even in the old days—as well as today in the extraordinary form—most of the Divine Office for this day comes from the Common of the Blessed Virgin Mary. There was a brief period of time during which Pope Blessed Paul VI had designated the first of the year as a “World Day of Prayer for Peace,” and had authorized the use of a Votive Mass for Peace and Justice on this day, but the current edition of the Roman Missal makes no mention of this, and the Ordo in force in the dioceses of the United States explicitly forbids this practice now. So, 'round and 'round the Churches of Christendom went, celebrating different things on this day, only to finally land, once and for all, right back where they all began: a commemoration of the Circumcision of our Lord, with a special focus upon His Mother, even if they all give the feast a different name. The Gospel lesson, which ends with mention of our Lord's circumcision, begins with the visit of the shepherds to the manger, and I can't help but picture it as a somewhat surreal scene. When the Magi eventually show up on the feast of the Epiphany, at least they're well dressed, and they're not empty-handed. But I'm tempted to picture the visit of the shepherds as a kind of Spike TV version of the Epiphany: they're scruffy-looking because they're shepherds; they haven't brought anything with them; they tell Mary and Joseph this bizarre tale about how they heard about the birth of their Child from some invisible choir of angels. It's interesting to note that, practically speaking, there are no commentaries on these verses. Everyone, from the Fathers of the Church of the second century to Pope-Emeritus Benedict, wax eloquent about the visit of the Magi, but nobody seems to have anything to say about the shepherds or what they're doing there. The Gospel says that “All those who heard it were full of amazement at the story which the shepherds told them…” (Luke 2: 18 Knox). I'll bet they were; they were probably scratching their heads thinking, “Who on earth are these guys?” and St. Luke was just putting a polite face to it. Of course, in reality the scene is very similar to the one to be played out though the Church's liturgy on the day of Epiphany this Sunday (or on January 6th in the extraordinary form); but, then again, the Magi cut a very different profile from the shepherds. What is it they used to say? If you're poor, you're crazy, but if you're rich, you're just eccentric. Both groups of men have fantastic stories to tell about how they came to know about the birth: the shepherds are hearing choirs of angels, the Magi are chasing after a UFO; but, both have come to do Him homage. The Magi get a feast on the Roman Calendar to commemorate their visit; the shepherds get an afterthought on a feast of the Mother of God. I wonder which visit our Lord appreciated more. I guess I've taken a lighthearted approach to this feast only because I fear our brains are fried after all the seriousness with which we've had to contend in the celebrations on and surrounding our Blessed Lord's birth. We, after all, are the diehards; most everyone else is probably hung over today. But regardless of whether we have come here on the first of the year to commemorate our Lord's circumcision, or to honor the Immaculate Mother of God, or both as the liturgy does, we might as well take a page from the secular world around us and use the day to take stock. Of course, there's no reason the new year has to be the only time we can put the mistakes of the past behind us and start anew, but it seems natural for people to do so. So, who have you been this past year, and whom do you want to be? Some people, I suppose, are fortunate enough to be Magi: well respected, always appreciated, all the mistakes they make are somehow excused; but most of us, I think, are shepherds: schlepping along, doing the best we think we can for our Lord, grateful for what we've received, but never seeming to have much to give in return. And I think we need to be OK with that, especially since our Blessed Mother, whose feast we celebrate today, was OK with it. After all, when the Magi are done bowing and scraping and handing over their expensive presents and then leave, nothing is said; there is no recorded reaction from either the Mother of God or Her husband. But after the shepherds leave, Saint Luke is very clear: “And Mary kept all these things, reflecting on them in her heart” (Luke 2: 19 NABRE). And I, for one, am quite satisfied to be a reflection in the Heart of our Immaculate Mother.